The SpeakandSpell also known as La Dictee Magique by Texas Instruments was a popular and revolutionary electronic toy consisting of a speech synthesizer and a keyboard. This Speak & Spell is tested, it has the rare audio out port - best for circuit bending projects. The Speak & Spell consists of a pushbutton keyboard, microprocessor, display, ROM (contains speech data), voice synthesizer, and loudspeaker. Your child can learn just like you did back in the 80's. There is 5 different games included with it. Mystery, Secret, Letter, Say It and Spell It. Great for everyone that deals with electronic music. As used by Kraftwerk or in the Film E.T. Good working condition, runs with batteries or power supply (both not included). The idea with the Speak & Spell was that it would 'speak' words at random and the child would then be required to spell it using the 'keyboard' - if the child got it right, he/she would be told - otherwise "ERROR". For the time, it was actually quite a sophisticated little mini-computer with a a large vocabulary of stored words, letters and numbers that were replayed in truly glorious lo-fi 8-bit through a rather crappy on-board speaker. 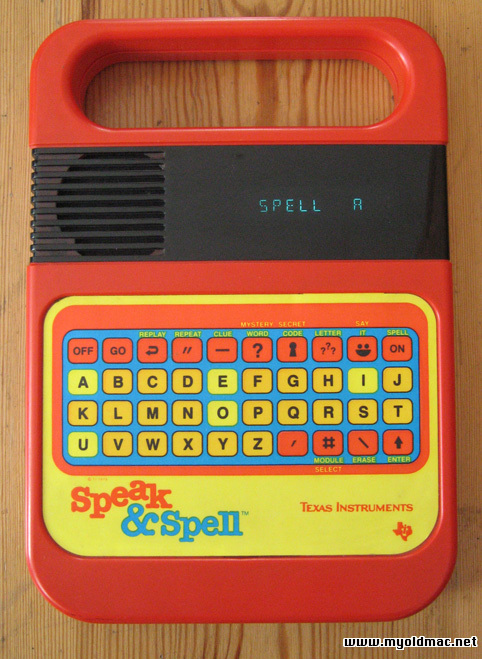 The Speak and Spell was created by Texas Instruments during the late 1970s. Speak & Spell was the first of a three-part talking educational toy series that also included Speak & Read and Speak & Math. The Speak & Spell was sold in the United States, Canada, and in Europe; it was originally advertised as a tool for helping young children to become literate, learn to spell and learn the alphabet. The Speak & Spell had a distinct orangish-red with yellow color scheme with a light blue border around the membrane keyboard. The early Speak & Spell units were sold in 1978. Variants included the Speak & Read, which was yellow with blue and green accents and focused on reading comprehension, and the Speak and Math (Maths in the UK), grey with blue and orange and centered on mathematics. A French Speak & Spell, La Dictee Magique, was sold primarily in Canada. The unit could use either 4 "C" batteries or 6 volt DC power adapter with positive tip polarity. The display was a vacuum fluorescent display. The original Speak & Spells had raised hard-plastic keys while later units had a membrane keyboard. The Speak & Spell used the first single-chip voice synthesizer, the TI TMC 0280, which utilized a 10th-order linear predictive coding model. A variant of this chip with a very similar voice would eventually go on to annoy drivers of Chrysler vehicles in the 1980's as the Electronic Voice Alert. 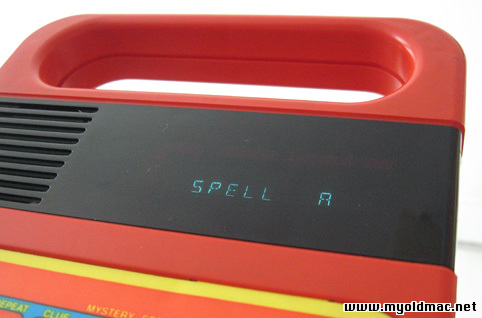 Speak & Spell had five distinct learning games: Spell, Say It, Secret Letter, Mystery Code, and Word. Spell is the classic word spelling game where the participant must spell ten words to the best of their ability. The Speak & Spell also had the ability to expand its vocabulary using expansion modules that plugged into a slot near the battery compartment. One such expansion module was a tie-in for the toy's notable appearance in the movie E.T. the Extra-Terrestrial and asked young spellers to try their hand at such words as "geranium" and "extraterrestrial". See the Speak & Spell Video - A vintage Speak & Spell TV commercial from the 80's featuring Bill Cosby. Die seltene Ausgabe des Sprachcomputers von Texas Instruments - Speak & Spell mit Audio Out Port - die beste Version für "Circuit Bending" Projekte. Viel Musiker (zB Kraftwerk, AphexTwin) nutzen dieses alte Gerät für Sprachsamples. In sehr gutem Zustand, getestet. Mit diesem Computer hat die deutsche Gruppe Kraftwerk einige Ihrer berühmtesten Tracks programmiert, ua: We are the Robots und Numbers ! Ein Sammlerstück erster Güte, das auch heute noch Verwendung findet in vielen Techno- und Elektrotracks. 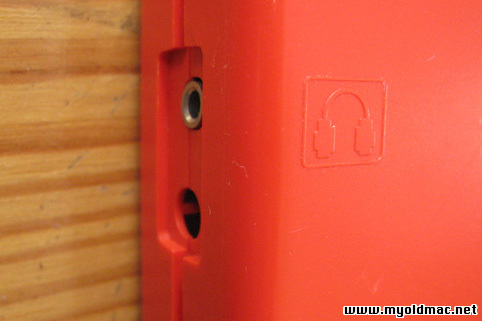 Dies ist die seltene Ausgabe mit Folientastatur und Modulschacht, jedoch ohne Audio-out - man muß entweder per Mikrophon aufnehmen oder durch Anzapfen der Lautsprecherkabel. 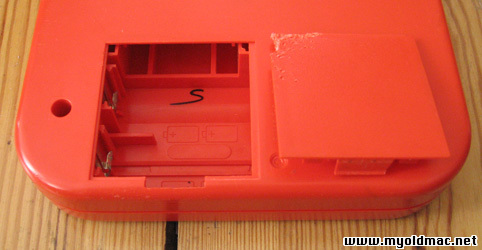 The Speak and Spell has the optional audio OUT port - rare model ! Das Speak and Spell hat den optionalen Audio OUT Port - sehr selten!